Continuing our occasional series of guest posts on suffrage and the theatre, we’re delighted to publish this piece by Deborah Clair and Philippa Urquhart on their exciting new play about Emily Wilding Davison in Parliament. The idea for this play came to me about two years ago. I wanted to write a really engaging two-hander with some fully-rounded, older female characters. Such characters unfortunately tend to be quite a rare commodity in the world of theatre. I knew the story of Emily Davison, hiding in the cupboard in St Mary’s Undercroft to avoid the 1911 census and I had always thought that it was such an ingenious piece of protest as, when Emily was found, her residence had to be recorded as ‘House of Commons’ on her census form. Further investigations revealed she was found by a male cleaner who entered the Chapel of St Mary’s Undercroft on Monday morning. I marvelled that Emily had managed to remain undiscovered for more than 40 hours and began to wonder how she had sustained herself for that long? Then, I pondered the idea that Emily may have had assistance in some way. Perhaps she was discovered earlier during her stay by someone else – a female cleaner? I thought that might make a fascinating encounter – between two completely disparate women, who in any other circumstances would never have met, either side of a cupboard door. I began researching women’s suffrage, the period before and the aftermath of census night 1911 and Emily Davison herself. Jill Liddington’s Vanishing for the Vote was most illuminating and provided a focussed picture of the events of those few days and weeks, more than 100 years ago. However, it wasn’t until I finally plucked up the courage to contact Parliamentary Archives in March 2017 that the concept for our play really came to life. I say, ‘plucked up the courage’ because until this point I really wasn’t sure if a female cleaner would be in St Mary’s Undercroft on the eve of census night or indeed if female cleaners worked in Parliament at all, at this time. To my huge relief, Dr Mari Takayanagi replied and the response could not have been better. It transpired that Mari had written a chapter of her thesis on this subject – the thesis began by imparting the little-known fact that it wasn’t just Emily Davison in Parliament on that night in 1911, but over 60 other women were living and working under that roof and were recorded on the census schedules. Mari suggested that a female servant from one of the many households in Parliament could have discovered Emily. I decided that a servant from Speaker’s House would be a good choice. Emily had several run-ins with Speaker Lowther over this period, until he eventually placed her on a black list of persons not welcome on the Estate. Mari’s thesis even gave us the idea for the title of our play, as it re-counts the story of a woman in the 1700s who was brought to work in a Parliamentary residence with the special task of making up the fires. She is recorded as a ‘necessary woman’, her name unrecorded in the Parliamentary employment archives of the time as a testament to so many forgotten and used working women throughout history. Our play suggests that Emily and Mary are both necessary women in their own unique ways, both figuratively and literally, with the play highlighting their different expectations of life and experiences. I was introduced to Deborah by a friend who knew she was looking for a fellow actress to collaborate with on creating A Necessary Woman. We started work together sitting side by side at her dining room table, heads together in front of her laptop. Deborah had her idea of the beginning and the end of the play but the journey between was uncharted territory. I had learnt a tiny bit about the suffragettes at school, but really knew very little about them – I’m sure this is the same for many people. Researching the history of the suffrage movement and the activities of the suffragettes in their astounding fight for women’s rights over the years of the late 19th and early 20th centuries has been a revelation to me. Discovering about the methods these women used to make their protest, non-violent and in the end violent, seen particularly in the context of their time, is both shocking and inspiring, with a strong element of delight at their ingenuity. Helping to create Mary Tatton, an imaginary character, and putting flesh on the bones of Emily, who really existed, has been a wonderful and creative opportunity. I hope A Necessary Woman will spark the interest and imagination of our audiences, it has certainly been an exciting and rewarding journey for us. Our play had its premiere at Royal Holloway University (Emily Wilding Davison’s former college) on the eve of International Women’s Day. This year, in celebration of the passing of the Representation of the People Act, we will be touring schools, art centres, and other locations of significance to Emily’s life. 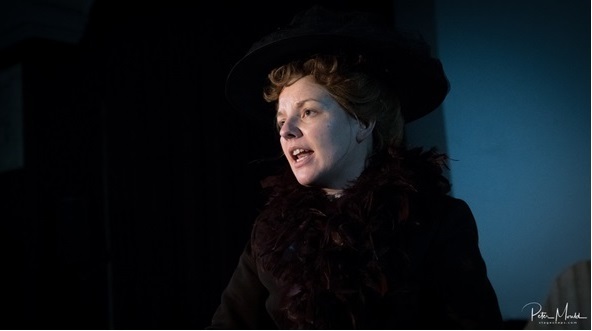 Whilst researching the play we also discovered that on that night in 1911, Emily had a further goal – to hide in the House of Commons and make a surprise speech to MPs on the Monday morning, during Prime Minister’s Questions. She never made it. Now, with the support of Nicky Morgan MP, we are bringing Emily back to Parliament to make the actual speech she had planned to an audience of MPs. We hope this will be a fitting tribute to Emily Davison and all those unsung heroines who worked in Parliament over hundreds of years without recognition or indeed the right to vote. A Necessary Woman will be performed at Portcullis House on Monday 26 March 2018.